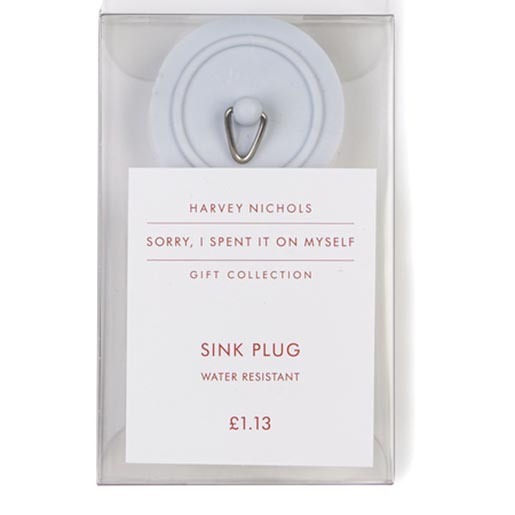 Harvey Nichols, the British fashion store chain, encouraged lavish spending during this year’s Christmas season with “Sorry, I Spent It On Myself”, a campaign centred on self indulgence. Shoppers were playfully encouraged to choose from a range of low budget items for their family and friends, while spending up large on themselves. The Ultra Low Net Worth (ULNW) gift range included a water resistant sink plug (£1.13), 100% real wood toothpicks (47p) authentic Lincolnshire gravel (£1.61), and Christmas Lunch in a Tin (with most of the trimmings) for £1.89. The campaign has included windows and in-store displays, a downloadable Christmas card (just the basics) from the Harvey Nichols website and social media using the #SpentItOnMyself hashtag. What would be interesting is to now explore the overall impact of the campaign. Did the humour appeal to those likely to spend money on fashion? Was there any fall out among British shoppers? 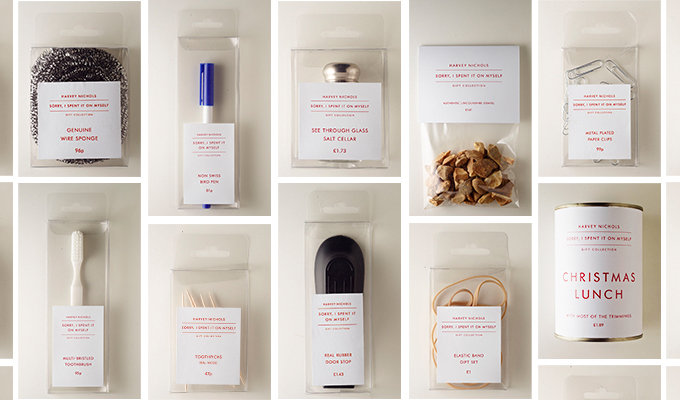 “So whilst shopping at Harvey Nichols for the festive season why not pick up a pack of Toothpicks to gift a loved one, and perhaps a pair of Louboutins for yourself (what else are you going to wear to the Christmas party?) Christmas cooks will thank you for a See-Through Glass Salt Cellar (salt not included) and show your appreciation for their hard work by looking seriously stylish for Christmas lunch in a new Lanvin dress”. The campaign was promoted with “Sorry”, a commercial showing people’s less than enthusiastic reactions to the gifts. As the film progresses, we gradually realise that in each case the impeccably dressed gift-givers appears to have spent rather more time and money on themselves than their nearest and dearest. Products were previewed in “Range”, a film highlighting the products’ attributes. 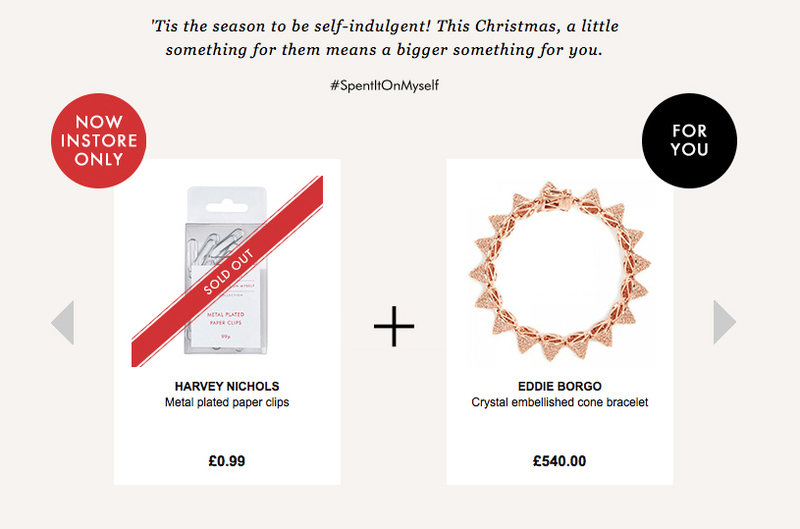 “We had great fun coming up with ideas for the products–the main criteria being: what presents would you really not want to get?” adds Brim. The Sorry campaign was developed at adam&eveDDB, London, by executive creative directors Ben Tollett, Emer Stamp, Ben Priest, copywriter Daniel Fisher, art director Richard Brim, business director Paul Billingsley, account manager Kannayo Okolie, planner Jessica Lovell, production designer Alex Fairman, creative producer Kirsty Harris, agency producers Daniel Moorey (Range) and Victoria Keenan (Sorry, I Spent It On Myself), working with Harvey Nichols marketing director Julia Bowe, marketing manager Anna Davidson and senior marketing executive Alexa Mullane. Media was handled at Rocket. Filming was shot by director James Rouse via Outsider (Sorry I Spent It On Myself) and James Day via Siobhan Squire (Range), with director of photography Alex Melman (Sorry).